The ICPSR Summer Program offers courses in multiple locations throughout the United States and around the world. Our First and Second Four-week Sessions take place on the University of Michigan campus in Ann Arbor, Michigan. Our short workshops take place in Ann Arbor, as well as the following cities: Amherst, Massachusetts; Berkeley, California; Boulder, Colorado; Chapel Hill, North Carolina; Florence, Italy; Houston, Texas; Salt Lake City, Utah; and Vancouver, British Columbia. For participants in a short workshop taking place in a city other than Ann Arbor (e.g., Amherst, Glasgow, etc. ), we will provide you with travel and visitor information via email after you have completed registration and payment for your workshop. If you need advance logistical information for an off-site workshop, feel free to contact us. Individuals with disabilities are encouraged to contact ICPSR to ensure that appropriate arrangements will be made for building and equipment access. All four-week courses in the First and Second Four-week Sessions take place in classrooms on the University of Michigan central campus in downtown Ann Arbor. In 2018, the ICPSR Summer Program headquarters will be located in the Helen Newberry Residence building at 432 S. State Street. Three- to five-day workshops held in Ann Arbor take place on the University of Michigan central campus. Participants will be informed of the location of their workshop and other logistical information after full payment for the workshop has been received. A vibrant Midwestern city noted for its friendliness and sophistication, Ann Arbor is a wonderful place to visit and live during the summer. The city is host to several festivals and fairs, including free nightly music and movies for three weeks in June, as well as an art fair in mid-July featuring more than 1,000 artists from around the nation. For participants looking to unwind and have fun after a day of learning, entertainment options run from museums and art galleries to movie theaters and concert venues. The downtown and campus areas are filled with restaurants, cafes, and bars where al fresco dining is the norm. A 10-minute walk from downtown, the Huron River offers outdoor enthusiasts a chance to cool off and relax in a canoe, kayak, or inner tube. Parks line the riverfront, providing plenty of opportunities to jog or hike wooded trails, play soccer or disc golf, and grill. From June through August, the days are often sunny and warm, with average highs in the 80s. It doesn't hurt to bring an umbrella to ward off the occasional shower. We also strongly recommend bringing a jacket or sweater, since the classrooms are air-conditioned and can get chilly. From Ann Arbor, Detroit is an hour's drive to the east, and Chicago is four hours by car to the west. 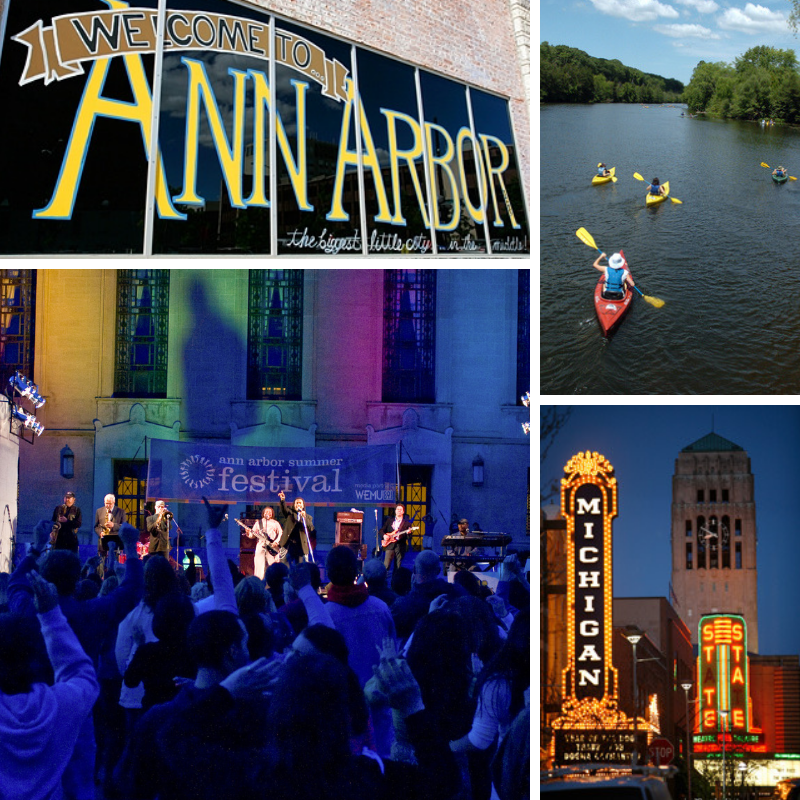 More information about Ann Arbor is available from the Ann Arbor Area Convention and Visitors Bureau and the Ann Arbor Observer. Summer Program participants in our four-week sessions and our short workshops are responsible for their room and board. View our housing suggestions for participants in the First and Second Summer Sessions. View our lodging suggestions for participants in a Three- to Five-day Workshop. Ann Arbor is 25 miles from Detroit Metropolitan International Airport (DTW) via I-94. The most affordable transportation option to and from DTW is Michigan Flyer, a public charter bus that stops in Ann Arbor at the Blake Transit Center downtown (about a 5-minute walk from the University of Michigan campus). Fare is $12/person one-way with advance reservation, and $15/person one-way without a reservation (if seats are available). Other transportation options include Metro Cars, and the Ann Arbor Metro Airport Shuttle. Greyhound buses service Ann Arbor from locations around the U.S. and Canada. The Greyhound station is located at 325 Depot Street (the Amtrak Station). Megabus is a low-cost bus service with routes connecting Ann Arbor with Toledo, OH and Chicago. Buses arrive and depart from the University of Michigan commuter lot at 2678 S. State Street. Amtrak operates three daily eastbound trains (to Detroit) and three daily westbound trains (to Chicago) that depart from the train station at 325 Depot Street. Amtrak also offers an evening bus to Toledo to meet an overnight train to the east coast. For more information about transportation, including taxis, Zipcars, car rentals, and city bus services, visit the Ann Arbor Area Convention and Visitors Bureau Transportation page. Additionally, the University of Michigan operates its own line of buses that anyone can ride for free. For a list of routes and schedules, visit the University of Michigan's Parking and Transportation Services website. Parking on the University of Michigan campus is extremely limited. Unfortunately, the ICPSR Summer Program is not able to provide on-site parking for its participants. There are two University of Michigan lots near the Perry and Newberry buildings that offer a few visitor parking spaces: lot W5 at Maynard Street and Jefferson Street, and lot W13 on Thompson Street near William Street. You can view both lots on this map. Parking fees, maximum hours of use, and enforcement hours are posted at pay machines in these lots, which accept currency, coin, and credit cards. The city of Ann Arbor offers numerous public lots, structures, and parking meters. The hourly parking lot rate is $1.50/hour ($1.70 after 3 hours). The hourly parking structure rate is $1.20/hour. The hourly parking meter rate at curbside spaces is $1.60/hour. Street meters are enforced Monday through Saturday, 8 a.m.-6 p.m. All city parking is free on Sundays. You can find some free parking in the neighborhoods to the south, west, and north of the downtown and campus areas. Some streets near the University have 1- to 2-hour time limits. Be prepared to walk, on average, 10-20 minutes to campus if you choose this option. International participants traveling to the United States to attend the Summer Program should review the International Participants page for clarification about visas and other required travel documentation.